CaixaForum Barcelona is an art gallery sponsored by Barcelona bank "la Caixa. It was opened in 2002 in a former factory building in the Montjuïc area. Although it is primarily It is one of the most active and lively cultural centres in Barcelona. The building itself is worth visiting for its architecture, which is designed by renowned architect Puig i Cadafalch. To access the museum one needs to take the elevator to the basement lobby and then go up to the ground floor exhibit area. The CaxiaForum also has a library, an auditorium, a restaurant and classrooms where educational programs are conducted. 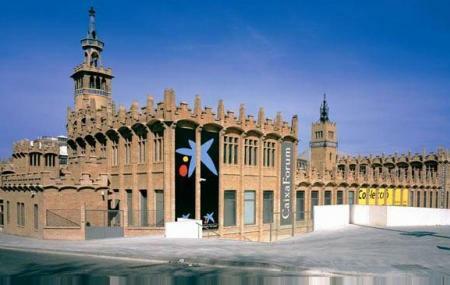 How popular is Caixaforum Barcelona? People normally club together Barceloneta and Poble Espanyol while planning their visit to Caixaforum Barcelona. Always interesting exhibitions. The building itself is free to explore and fascinating. The cafe has been renovated - a bit tastelessly, the previous version was much better - but the lunch menus are still excellent, well-priced and imaginative. Especially good for the return Barcelona visitor or to relax from the other, overcrowded sites. Went to their Velazquez & Toulouse-Lautrec exhibitions. These were well-balanced, not overstuffed, as can be the case elsewhere I Europe. They always have interesting temporary shows that might be overlooked by the usual visitor to Barcelona. The location is kind of odd, but nearby is Plaza España and a weird shopping center, The Arena, actually a converted old bullring. There are audioguides for the exhibitions which are in various languages and these are very informative. Of course, the staff here, I imagine, speak English.